When my wife's great grandfather, Joseph K. Dinkel, came to Chicago in the early 1900's, he brought with him remarkable baking skills and recipes from a long line of master bakers in southern Bavaria, Germany. He was able to open a small bakeshop in 1922 with the help of his wife, Antonie. For the first ten years, it was Joseph baking in the back of the shop and Antonie selling. Joseph's delicious baked foods quickly became very popular throughout the city. In 1932 as the popularity of Dinkel's baked foods grew, Joseph and Antonie expanded the current location. It was about this time that their son, Norman Dinkel, Sr., came into the business and continued to build the quality reputation of the business. In the early 1970's, Norman Jr. took over the helm of the bakery thus embarking on the third generation of the business. As word spread of the bakery's quality products, demand for Dinkel's baked goods began to come in from loyal customers across the country (and even overseas!). 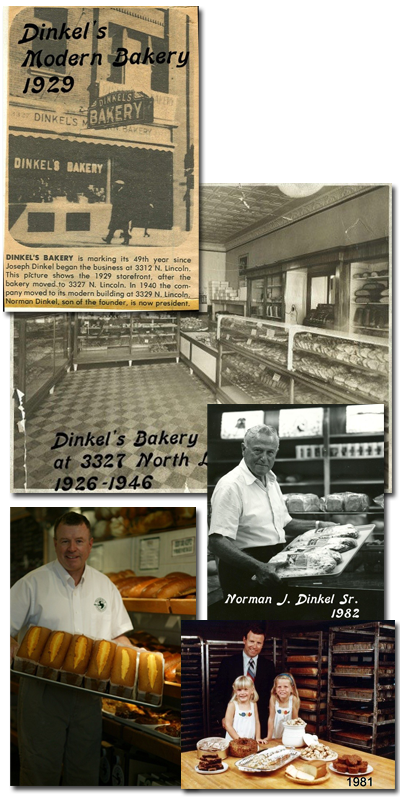 In 2008, I came to work at Dinkel's alongside my wife, Sandgren, and continue to work with my father-in-law, Norman Jr., to continue to learn the baking traditions still practiced at the shop today. I come from a German family coincidentally rich in baking history as well. My grandfather, Henry Karl, Sr., was the third generation to run Karl's Bakery in Kansas City, which operated from the early 1900's until 1978. Though I never saw my family's bakery in operation, my family still continues to lovingly bake his wonderful recipes for our family and friends to enjoy. This has given me an understanding of, and appreciation for, real quality baked goods and family tradition. This is why I am proud to be a part of the Dinkel's tradition (now in its fourth generation) and am so proud to pass on this love of tradition to my children. Enjoy!